Bill was excellent. Not only professional with the fit, tips and hints to improve my game. Well worth the drive up from Somerset. Helpful Informative and constructive. Bill was excellent. The whole experience was great and nice to feel the purchase was very specific. Anyone purchasing new equipment should invest in this experience. Excellent service – thank you. Unbelievable choice of clubs for a Left Hander! I Bought 2 Vokey Wedges and over the weekend the price dropped on them. I called them on Monday and they gave me credit to the value they had decreased. Next day Delivery and extremely well packaged. Bought a new TaylorMade M1 Driver for £149.99 Brand new. Excellent value for money. Can pay over the phone where they offered good advice on shaft options for driver and bounce and grind angles for my wedges! We visited here as my partner is left handed and there is little choice of golf clubs around the country. Here you can be fitted and try the many ranges on offer. There is also the Doug McClelland shop with a good choice of clothes and shoes. We wanted to write to say how well we were looked after by Dave and Paul in the left-handed shop recently. It was about 3 months ago and I meant to write before but did not get around to it. I was reminded to write because I was down at Silvermere again today buying a couple of clubs. I am a keen golfer and brought my partner down to buy her first set of clubs about 3 months ago. 2) Normal guys who weren’t too over the top with the sales patter. We felt we got proper advice but without all the guff that sometimes accompanies sales processes! They were genuinely eager to help us. On top of the great service, they also did us a decent deal on the clubs and bag we sold. It might not have been the biggest sale of the day for you, but believe me, it has contributed to me spending about £1000 in total over the last 4 months and I am sure I will be back. Note I was also very well looked after today by Jamie Northcote, so thanks to you too Jamie. I just wanted to thank you for the great service - clubs arrived yesterday and are perfect! New putter has arrived, chuffed to bits with it, thank you for the great service, will shop with you again. Terry, would you thank Robert, Paul & James for their help and assistance when buying my Titleist driver. Arrived in Spain on time, as usual. Even I have been able to adjust to suit might look like a golfer one day!! To all left- handed golfers worldwide the advice & service from Left Handed Golf is 5 star. I’ve received the driver today to complete my order and I just wanted to thank you and your team for such great customer service which is the exception rather than the norm these days, so keep up the good work, I shall return! Just a line to say how impressed I was with the service I received on Saturday. I was in two minds as to whether the one and a half hour journey was worth it till I arrived. The guys in the shop couldn’t have been more helpful in suggesting drivers for me. I tried the 3 recommended and came away fairly certain of my choice. Today I confirmed that I made the right decision. Thank goodness there is a place where left handed golfers have the choice of club right handlers get! 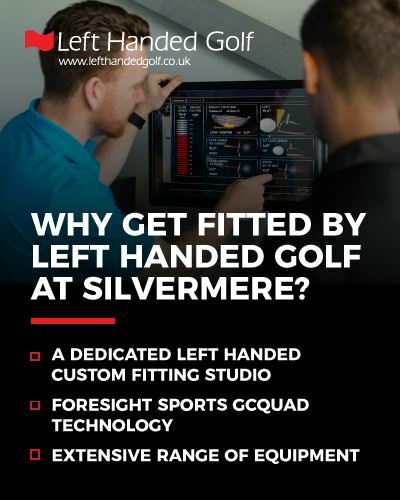 Fantastic service, heaven for lefties!! First of all thank you for your personal treatment, the order was delivered on time and the clubs were brand new unbelievable. The next order when I need something I will order from you. I am happy for the shipping offer of the last order I also understand that you cannot always offer it at that low a price.